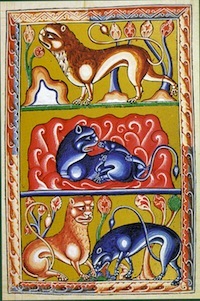 Whether in whole volume allegorical bestiaries, a bestiary chapter in Brunetto Latini's Le Livre du Trésor, satirical roles played in the Roman de Renard or Roman de Fauvel, their symbolism and terminology in the cynegetic literature of Le Livre de Chasse, or in vernacular translations of Esop's Fables, animals were prominent in medieval literature. Manuscripts for these are often rich in illustrations, a wealth of images which can be previewed through Google images of the Livre de chasse, the Bestiaire médiéval, the Roman de Renart, the Roman de Fauvel, and the Livre du Trésor. This page, devoted to the vernacular representation of animal lore in the French Middle Ages, is part of the Andy Holt Virtual Library's "Manuscripts of Medieval France with Vernacular Texts", a collection of over 800 links to manuscript facsimiles and nearly all of the French medieval literarary canon. MS Paris BNF Français 368 (Anc. 6985) Renard le Contrefait, etc. MS Paris BNF fr. 1446 [Anc. 7834(3.3)] - Couronnement de Renard, Fables. etc. MS Paris BNF fr. 983 (Anc. 7304) - L'Exposicion des fables Ysopet, Le Livre du Tresor de sapience, etc.